Idiopathic pulmonary fibrosis (IPF) is a morbid, refractory lung disorder with an unknown pathogenesis. To investigate potential adaptive immune mechanisms in IPF, we compared phenotypes and effector functions of peripheral CD4 T cells, autoantibody production, and proliferative responses of pulmonary hilar lymph node CD4 T cells to autologous lung extracts from afflicted patients and normals. Our results show that greater proportions of peripheral CD4 T lymphocytes in IPF subjects expressed MHC class II and CD154 (CD40L), and they more frequently elaborated TGF-β1, IL-10, and TNF-α. Abnormal CD4 T cell clonal expansions were found in all IPF patients, and 82% of these subjects also had IgG autoantibodies against cellular Ags. IPF lung extracts stimulated proliferations of autologous CD4 T cells, unlike preparations from normals or those with other lung diseases, and the IPF proliferative responses were enhanced by repeated cycles of stimulation. Thus, CD4 T cells from IPF patients have characteristics typical of cell-mediated pathologic responses, including augmented effector functions, provision of facultative help for autoantibody production, oligoclonal expansions, and proliferations driven by an Ag present in diseased tissues. Recognition that an autoreactive immune process is present in IPF can productively focus efforts toward identifying the responsible Ag, and implementing more effective therapies. Idiopathic pulmonary fibrosis (IPF)4 is a fibroproliferative lung disorder, characterized clinically by pulmonary restriction and hypoxemia, which afflicts ∼40,000 patients in the United States annually (1). The prognosis of IPF is grim, with mean survival of ∼3 years after diagnosis, and to date, no medical regimen has been shown to alter the natural history of this disease (1, 2). The etiology of IPF is unknown. It has recently been hypothesized that immune responses are not important in the development of this disease, and the pathogenesis of the disorder has instead been speculated to result from noninflammatory injuries or other primary dysfunctions of pulmonary epithelium and/or fibroblasts (2). We undertook these studies to examine the possibility that adaptive immunity may participate in IPF pathogenesis. Attention was focused on CD4 T cells, given their role in orchestrating immune responses and their importance in other fibroproliferative diseases (3, 4). We found that circulating CD4 T cells of IPF patients, compared with cells from healthy volunteers, are more frequently activated, elaborate mediators that have been implicated in pathologic tissue fibrosis, provide help to B cells that produce autoantibodies, and have undergone oligoclonal expansions. Moreover, hilar lymph node CD4 T cells of IPF patients uniquely proliferate in response to Ags present in autologous lungs. The behaviors of CD4 T cells of IPF patients are analogous to those seen in other immune disorders manifested by aberrant fibroproliferation and organ dysfunction (3, 4). These findings show that autoreactive adaptive immune processes are present in IPF (5), and may suggest directions for subsequent research, including identification of the responsible Ag, targeted immunomodulation, or eventual induction of Ag-specific tolerance. Peripheral blood was obtained by venipuncture from IPF patients referred to the University of Pittsburgh (Pittsburgh, PA) or the Ochsner Clinic (New Orleans, LA). All IPF subjects had been evaluated by detailed clinical assessments and laboratory measures, and all fulfilled established diagnostic criteria (1). None of the IPF subjects had known comorbidities, notably, other autoimmune or immunologic syndromes, malignancies, infections, or occupational or drug exposures known to cause lung diseases. Blood for comparative studies was obtained from normal volunteers recruited from hospital personnel by solicitation. Assays were performed concurrently in consecutive specimens from both study groups, whereas the laboratory investigators were blinded to nuances of their clinical presentations, demographics, or medical treatments. Written informed consent was obtained from all subjects, in accordance with the responsible Institutional Review Board. PBMC were isolated from blood by density gradient centrifugation. CD4 cells were positively selected from PBMC for T cell Ag receptor β-chain variable region (TCRBV) gene characterizations with anti-CD4-mAb coated magnetic beads, following the manufacturer’s protocol (Dynal Biotech). Cell surface molecule expressions were ascertained using fluorochrome-conjugated mAbs. Unless otherwise stated, Abs and other reagents for flow cytometry, including negative isotype controls were purchased from BD Pharmingen. Intracellular cytokine elaborations were determined in PBMCs stained with anti-CD4 Ab and stimulated for 5 h with phorbol 12-myristate 13-acetate (5 ng/ml) and calcium ionomycin (500 ng/ml) in the presence of GolgiStop (BD Biosciences). Cells were fixed and permeabilized, and stained with fluorochrome-conjugated Abs against selected cytokines, including TGF-β1 (IQ Products). Flow cytometry was performed on ≥10,000 live cells and analyzed using a Coulter EPICS XL.MCL (Beckman Coulter) and EXPO 32 software (Applied Cytometry Systems). Autoantibodies were detected by immunoprecipitation, as we have previously described (6). In brief, plasma specimens from subjects were incubated with protein A-agarose beads (Invitrogen Life Technologies) overnight at 4°C. The Ig-bound agarose beads were coincubated with [35S]methionine/cysteine radiolabeled K562 lysates. The Ag/Ab-bound beads were washed thoroughly and the immunoprecipitates were resolved by SDS-PAGE with visualization by autoradiography. Plasmas from healthy individuals were used as negative controls and standard reference samples were used as positive controls. The methodologies used to characterize TCRBV gene repertoires and determine T cell clonality have been detailed elsewhere (7). For this survey study, we used a preexistent and well characterized probe set consisting of riboprobes corresponding to 14 of the most frequently expressed TCRBV genes (7). Individual TCRBV gene levels were expressed as percentages of total specimen TCRBV mRNA. Normal ranges for TCRBV gene expressions were defined as the mean ± 2 SD of aggregate values obtained from normal volunteers in these and multiple previous studies (reviewed in Ref. 7). IPF and other diseased lung tissues (∼2.5 cm3) were dissected from surgical explants that were removed during pulmonary transplantations. Normal pulmonary specimens were similarly obtained from cadaveric harvests wherein the lungs were not used for transplantations. Diseased lung explants removed for transplantations were subjected to extensive histologic evaluations, including a variety of special stains, as well as microbiologic cultures. Lung tissue dissected for these studies was frozen on dry ice, and then minced and suspended in ice-cold distilled water containing 1 mM EDTA and 1 mM PMSF. The suspension was subjected to seven freeze-thaw cycles and centrifuged (12,000 × g), and the supernatant was sterile filtered. The addition of an equal volume of 2× RPMI 1640 restored isotonicity. Protein concentrations in lung explant extracts were determined by BCA protein assay (Pierce) and specimens (typically ∼10 mg/ml) were diluted in complete culture media (RPMI 1640 supplemented with 50 U/ml penicillin, 50 μg/ml streptomycin, 10 mM HEPES, 2 mM glutamine, and 10% heat-inactivated FBS) for use in proliferation assays. Hilar lymph nodes dissected from lung explants were forced through sterile mesh screens, and the cells were repeatedly washed and resuspended in complete medium before use in proliferation assays. Lymph node cells (4 × 105/well) were cultured in 96-well plates at 37°C (in 7% CO2) in complete medium supplemented with 10 U/ml rIL-2 (Roche) for 11 ± 1 days. Autologous lung extract proteins were added to respective wells at concentrations of 100 μg/ml. Each culture condition (extract or media control) was performed in triplicate, and the results were averaged. Proliferation of lymph node CD4 T cells was established by BrdU incorporation, using reagents and protocols supplied in a kit (BD Pharmingen). BrdU (10 μM) was added 72 h before harvest. Cells were stained with anti-CD4, permeabilized, and fixed. Subsequently, the cells were incubated with anti-BrdU and 7-aminoactinomycin, and the percentage of proliferating cells (BrdU+) was determined among viable (greater than diploid DNA content) CD4 T cells. Specific proliferation was calculated as the percentage of CD4 T cells that incorporated BrdU in cultures with lung extracts minus incorporation in autologous unstimulated (media control) cultures. In some cases, proliferation was assessed by incorporation of [3H]thymidine that was added (1 μCi) ∼18 h before harvest. [3H]Thymidine (cpm) was measured by beta emission counter, in triplicate wells for each condition, and the results were averaged. Intergroup comparisons of parametrically distributed continuous data (e.g., proportions of cells elaborating cytokines) were analyzed by unpaired two-tailed t test. Ordinal parameters (e.g., number of TCRBV abnormalities) or nonparametrically distributed continuous variables (e.g., BrdU incorporations) were compared by Mann-Whitney or Kruskal-Wallis, respectively, with post hoc analyses of the latter by Bonferroni-Dunn. Correlations between variables were established by Pearson product-moment correlation. Significance was defined as p < 0.05. Data are depicted as mean ± SEM. Peripheral blood was obtained from 48 IPF subjects described in Table I⇓. The relatively few subjects that did not have lung biopsies met all established clinical criteria for the diagnosis of IPF (1), including characteristic findings on high-resolution chest computerized tomography scans. Twenty-six (54%) of the IPF patients were not taking immunologically active agents or were on physiologic dose oral prednisone (≤10 mg/day). Fourteen (29%) were taking IFN-γ alone or in combination with other agents. Blood for comparative studies was obtained from a pool of 39 normal subjects. Gender distributions (56% male) and ages of controls (58 ± 2 years old; range 42–82) were similar to those of the IPF patients. Because quantities of the specimens were not sufficient to perform every assay described herein, not all tests were performed in all subjects. In addition, a few subjects in both populations were subsequently found to have autoimmune diseases, malignancies, or other disorders (e.g., herpes simplex) and were omitted from analyses. However, assays were performed concurrently in consecutive specimens from both groups while the laboratory investigators were blinded to nuances of their clinical presentations, demographics, and medical treatments. We initially hypothesized that if CD4 T lymphocytes were involved in IPF pathogenesis, we could expect to find evidence that activation of these cells was increased in afflicted patients. Activated human T cells express MHC class II molecules, and subpopulations of these cells may also up-regulate CD154 (CD40L), which, in turn, has been shown to have potentially important profibrotic effects (8, 9). As shown in Fig. 1⇓A, the CD4 T cells of IPF patients had significantly greater expression of both MHC class II (12.6 ± 1.2 vs 3.7 ± 0.8%) and CD154 (3.5 ± 0.6 vs 0.5 ± 0.3%) compared with normal subjects. A, Cell surface expression of MHC class II and CD154 among CD4 T cells of IPF patients (▪, n = 18) and normal controls (□, n = 18). B, Cytokine production by CD4 T cells of IPF patients compared with those of normal controls, determined by intracellular staining. n = 15 in each, except TGF-β1, which was studied in fewer normal (n = 8) and IPF subjects (n = 11) due to limited reagent. Effector T cells participating in immunopathogenic responses elaborate a variety of mediators that have been implicated in the development of pathogenic fibroproliferation, notably, including TGF-β1, IL-10, and TNF-α (4, 10). As shown in Fig. 1⇑B, and compared with normal subjects, significantly greater proportions of CD4 T cells from IPF patients produce TGF-β1 (6.0 ± 1.0 vs 2.1 ± 0.8%), IL-10 (2.8 ± 1.1 vs 0.5 ± 0.1%), and TNF-α (33.0 ± 4.3 vs 21.5 ± 2.5%). In contrast, MCP-1, IL-1β, and IL-6 were very infrequently (<1%) produced by both IPF and normal peripheral CD4 T cells under the conditions used for these in vitro cell stimulations (data not shown). To exclude the possibility that abnormal functions of IPF CD4 T cells observed here were artifacts of the treatments prescribed for these subjects, we performed post hoc comparisons after stratifications of the patients based on their medication regimens. We could not find any statistically significant effects of the therapies between the variously treated IPF subpopulations, although the small numbers in the respective groups may not preclude type II errors. Whatever trends seem present, however, largely suggested that immunomodulation actually tended to minimize at least some of the abnormal IPF lymphocyte functions observed here. As an example, the largest single drug treatment group among these IPF subjects consisted of the subpopulation administered exogenous IFN-γ. The doses of this agent used in IPF therapy have been reported to have minimal effects on in vivo immune parameters (11). Supratherapeutic concentrations of IFN-γ can up-regulate cellular facultative MHC class II Ag expression in vitro, although the percentages of CD4 T cells that expressed these activation markers were nearly identical among IPF patients prescribed IFN-γ (11.9 ± 2.1%, n = 6) and those not taking the agent (11.7 ± 1.5%, n = 12). This drug treatment seemingly also had no effects on IPF CD4 T cell expression of CD154 or productions of IL-2, TNF-α, IFN-γ, or TGF-β1 (data not shown). Other reports indicate exogenous IFN-γ may suppress IL-10 production in vitro (4), and there seemed a possible trend here for an association between IFN-γ therapy and decreased production of both IL-10 and IL-4 by CD4 T cells. The percentage of CD4 T cells elaborating IL-10 in the subpopulation of IPF patients who were not taking IFN-γ (4.2 ± 1.9%) tended to be greater than that of the IFN-γ-treated IPF subjects (1.2 ± 0.7), but this difference was not statistically significant, given the size of these populations (p = 0.18). Nonetheless, despite a much smaller number of subjects (n = 8), CD4 T cell IL-10 production in the former group was even significantly greater in post hoc comparison to the normal subjects (p = 0.01) than the original analysis using the aggregate (n = 15) IPF values (Fig. 1⇑B). Similarly, the proportion of CD4 that produce IL-4, another TH2 cytokine with potential profibrotic effects (9, 12), tended to be increased among the subpopulation of IPF patients that were not taking IFN-γ (5.8 ± 2.1%), compared with the patients administered this agent (1.4 ± 0.5%), but again this intergroup difference was not significant (p = 0.11). These IL-4 values among the IFN-γ-free IPF patients (again, despite their smaller number relative to the aggregate IPF group) were significantly greater than those of the normal subjects (p = 0.029). Although nonspecific measures of immune responses (e.g., quantitations of immune complexes) have not correlated with IPF extent (2), we reasoned that if CD4 T cells play a role in IPF pathogenesis, we might find associations between characteristics or functions of these particular cells and disease manifestations. Several CD4 T cell attributes seemed correlated with IPF clinical parameters. Among others, the proportion of CD4 T cells that elaborated CD154 was inversely associated with diffusing capacity (r = 0.49, p = 0.048), and the extent of IL-10 production was also correlated with forced vital capacity (FVC) (r = 0.56, p = 0.031). These parameters seemed even more closely correlated with pulmonary function tests in analyses limited to those IPF subjects that were not taking IFN-γ (see above) (r = 0.65, p = 0.02 for the correlation between CD154 and diffusing capacity, and r = 0.76, p = 0.028 for the association between IL-10 and FVC, as a percentage of predicted values). Also, CD4 T cell production of IL-4 among the IPF subjects not prescribed IFN-γ tended to associate with FVC percentage predicted (r = 0.68, p = 0.06). Because CD4 T cells can provide facultative help to B cells in the context of an adaptive immune response to specific peptide Ags, we also assayed for the presence of autoantibodies in the IPF patients with a highly sensitive immunoprecipitation assay (6). We found the majority of IPF patient plasma samples assayed here (18/22, or 82%) had demonstrable circulating IgG autoantibodies against cellular Ags (Fig. 2⇓). Nine plasma samples (41%) specifically immunoprecipitated an autoantigen migrating at 76–79 kDa. The majority of these particular specimens also coprecipitated 25–30 kDa and ∼34 kDa Ags. These findings are consistent with production of autoantibodies directed against a complex of cellular proteins, a typical finding in autoimmune disorders (3, 5). Plasmas from normal individuals were negative in this assay, as previously described (6). None of the IPF plasma specimens had autoantibodies that recognized known Ags associated with connective tissue diseases, including ribonucleoprotein complexes, topoisomerase I (Scl 70), centromere, RNA polymerases I, II, or III, Ku, polymyositis-scleroderma, Th/To, Smith, SS-A or Ro, SS-B or La, tRNA synthetases, or 5′ 2,2,7-trimethyl guanosine cap, using reference standard sera. 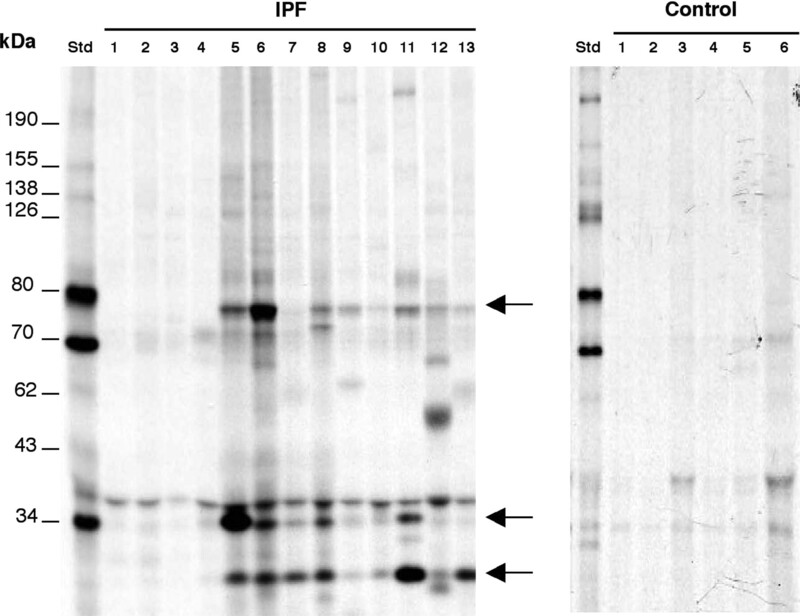 Autoantibodies in plasma of IPF patients immunoprecipitate various proteins from K562 cells. Shown are the results of 13 IPF patients and 6 healthy controls (numbered), m.w. standards (kDa), and defined autoimmune disease Ag standards (Std). Arrows denote frequently seen 76–79, 34, and 25 kDa Ags. 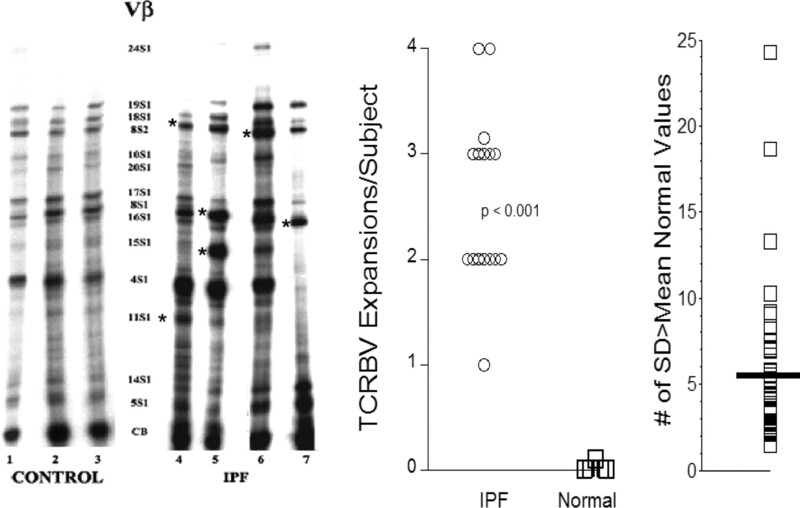 TCRBV region expressions of CD4 T cells were highly biased among all the IPF subjects studied here (Fig. 3⇓). Every one of these subjects had one or more abnormal gene expansions among the 14 TCRBV assayed here, and these perturbations were often of considerable magnitude (Fig. 3⇓). In contrast, TCRBV repertoires in all the age-matched controls were uniform with expression levels within normal ranges (p < 0.001). Left panel, Composite autoradiograph of TCRBV gene determinations by RNase protection assay. TCRBV profiles seem similar and individual gene values are within normal ranges among healthy controls (lanes 1–3). In contrast, IPF patients (lanes 4–7) exhibit markedly abnormal TCRBV gene expansions (>2 SD from mean normal values), denoted by asterisks (∗). Middle panel, Numbers of abnormally expanded TCRBV among individual subjects. None of the normal controls (n = 6) had abnormal expansions, but these were ubiquitous among IPF patients (n = 16). Right panel, The magnitude of the abnormalities among the IPF patients, defined as number of SD > mean normal values, was often considerable. Horizontal bar represents the mean. To confirm that CD4 TCRBV expansions in IPF subjects were specifically due to clonal proliferations, VDJ segments from representative specimens were cloned and sequenced (7). Invariable findings of shared sequences within all the specimens assayed proved the abnormal expansions were due to oligoclonal proliferations (Table II⇓). In some cases, the daughter progeny of a single progenitor T cell accounted for ∼100% of the abnormal TCRBV expansions. Because the hallmark of an adaptive immune response is a demonstration of Ag reactivity (3, 4, 5), we examined CD4 T cell proliferations in cocultures with water-soluble protein extracts of autologous lung explants from patients with end-stage IPF (n = 9), other lung diseases (n = 9), and normal lungs that were not used in therapeutic transplantations (n = 6). To exclude potential confounding of in vitro IPF cultures, we omitted analyses of IPF specimens with any evidence of microbial infection or colonization, determined by both detailed postexplantation histologic evaluations, and bacterial and fungal cultures. Likewise, none of the IPF specimens used here had gross or microscopic evidence of neoplasms. Lung explant specimens from patients with end-stage pulmonary artery hypertension (n = 4) were similarly free of infections and neoplasms. In contrast, we found it impossible to procure lungs from patients undergoing transplantation for end-stage chronic obstructive pulmonary disease (COPD) that were similarly unaffected, and all of these explant specimens (n = 5) had infections proven by microbial cultures or histology, or an intrapulmonary neoplasm. In addition, to preclude the remote possibility that intergroup differences in proliferative responses to autologous lung extracts might be due to inherent differences in lymph node cell populations, we characterized phenotypes of these preparations by flow cytometry among a consecutive series of recent specimens, and found no significant differences (Fig. 4⇓). Moreover, variations in responsiveness to added autologous lung extracts cannot be attributed to greater inherent (basal) proliferations, since there were no meaningful differences among unstimulated (media control) BrdU incorporations (Fig. 5⇓A). Phenotypes of pulmonary hilar lymph node cells. Characterizations of freshly isolated lymph node cells show no significant intergroup differences in cell populations or extent of in situ activation. A, BrdU incorporation by hilar lymph node CD4 T cells. There were no significant intergroup differences among nodal CD4 T cells in basal, unstimulated cultures. B, BrdU incorporation in cultures stimulated with autologous lung protein extracts was greatest among IPF CD4 T cells. 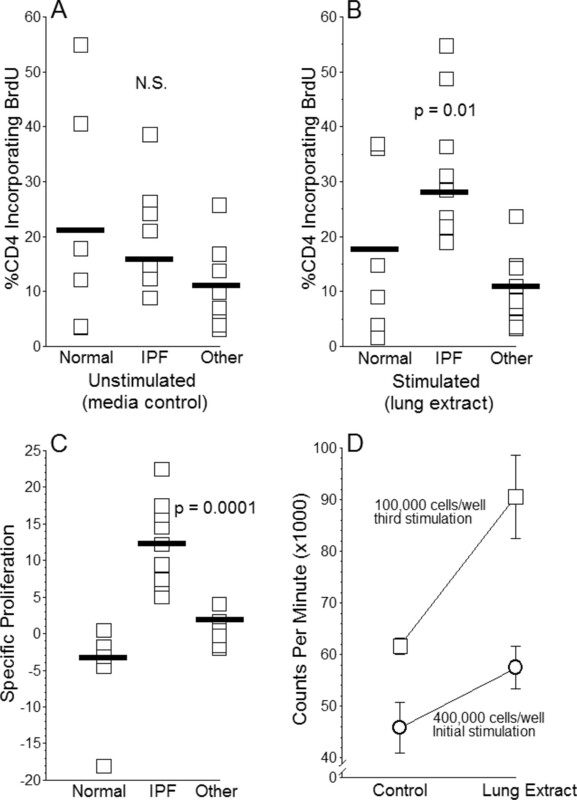 C, Specific proliferation (extract-stimulated minus unstimulated [media control] BrdU uptake in paired, corresponding cultures) was much greater in IPF CD4 T cells. D, Proliferation ([3H]thymidine incorporation) was enhanced in IPF lymph node cell cultures after repeated in vitro cycles of stimulation with autologous lung extracts, as shown in this example, despite using fewer numbers of cells and more dilute extracts in third stimulation (10 μg/ml protein) than in initial stimulation (100 μg/ml). “Other” denotes specimens with other lung diseases (COPD and pulmonary artery hypertension); N.S., not significant, p values (B and C) denote significant differences in comparisons between IPF and both other subject populations. Horizontal bars represent the means. We did find, however, that water-soluble protein extracts from autologous lungs always induced proliferation of lymph node CD4 T cells from IPF patients (Fig. 5⇑, B and C). With a single exception (a fungal-infected COPD explant), the addition of autologous lung extracts did not increase BrdU incorporation in specimens from the other subjects, relative to corresponding unstimulated (media control) cultures. Lung extract antigenicity, as determined by autologous lymph node CD4 T cell proliferation, was unaffected by extract boiling (for ≥20 min), repeated freeze-thaw cycles, and prolonged (>3 wk) storage at 4°C (data not shown). Repeated cycles of lymph node cell stimulation in vitro with the extract at 7- to 10-day intervals resulted in incrementally augmented proliferative responses, consistent with derivation of Ag-responsive T cell lines (Fig. 5⇑D). Furthermore, fractionations of the extracts using physiochemical techniques (based on protein size, charge, etc.) have also indicated that antigenicity, determined by autologous lymph node cell proliferations, can be enhanced by partial purifications. As an example, the greatest antigenicity in five specimens tested to date has been significantly greatest among those proteins that precipitate in the 40–60% ammonium sulfate saturation fractions (data not shown). We hypothesized the pathogenesis of IPF could involve injuries initiated or sustained by lymphocytes that were activated by a specific Ag. Following activation, “armed” effector T cells elaborate mediators and trigger inflammatory cascades that can cause aberrant fibrosis (3, 4, 12, 13, 14, 15). Multiple measures here show CD4 T cells in IPF patients have characteristics identical with those in other fibroproliferative diseases that are associated with abnormal immune responses (3, 4, 5). Among other observations, significantly greater proportions of circulating CD4 T cells from IPF patients were activated compared with normal controls. More tellingly, the present data also show highly biased peripheral CD4 TCRBV repertoires in the IPF patients (Fig. 3⇑) that are specifically attributable to oligoclonal proliferations (Table II⇑) and, hence, de facto evidence of a cellular immune response to a conventional peptide Ag (3, 7, 16). These particular data extend previous findings that indicated TCR repertoires of lung lymphocytes within bronchoalveolar lavages from IPF patients are qualitatively biased (17). Multiple previous studies have shown activated lymphocytes can directly augment collagen synthesis of mesenchymal cells (12, 13, 14, 15, 18, 19), and several T cell effector functions surveyed here could have particular relevance for IPF pathogenesis. Expression of CD154 was more frequent on the IPF CD4 T cells, and cognate engagements of this receptor with CD40 on fibroblasts cause the latter to increase their synthesis of collagen and proinflammatory mediators (8), as well as blunting inhibitory effects of IFN-γ on fibroproliferation (9). TGF-β1 also seems to play an especially important role in the development of fibroproliferative diseases (4, 10), including stimulation of fibroblast chemotaxis (20), augmentation of extracellular matrix production, and reduced degradation of these matrices by metalloproteases (21). The increased production of IL-10 by IPF CD4 T cells seen here is consistent with observations of TH2 dominance in many fibroproliferative disorders (4), although the actions of this particular cytokine have been variously implicated as both fibrosis promoting and inhibiting (4, 22). TNF-α, also shown here to be more frequently produced by IPF CD4 T cells, promotes in vivo fibrosis with overexpression in animal models (23), enhances actions or production of TGF-β (24), and increased elaboration by lung cells and PBMC from IPF patients has been previously reported (25). Our findings of numerous, diverse, and often complexed, circulating autoantibodies in >80% of IPF patients also extend a series of earlier reports that described several B cell abnormalities in this disease. Organized B cell aggregates have been noted in IPF lungs (26, 27), as well as intrapulmonary deposits of immune complexes (28). Several previous studies have also shown circulating immune complexes and autoantibodies against a variety of cellular self-Ags in IPF patients (29, 30, 31, 32). In addition to potential direct cytopathic effects (28), autoantibodies may also contribute to IPF pathogenesis by altered regulation of other mediators, including increasing TGF-β1 production by alveolar epithelium (32). The defining feature and proof of a cellular immune process is a direct demonstration of antigenicity (3, 4, 5). The present data show protein extracts of IPF lungs uniquely enhance BrdU uptake of autologous CD4 T cells (Fig. 5⇑), and characteristics of these proliferations are classic for responses to protein Ags. Although we cannot exclude the potential that the IPF Ag evident within lung explants is a product of a chronic infection (e.g., a virus) (1), it seems only remotely possible the CD4 T cell proliferations observed here were confounded by responses to acutely colonizing, irrelevant microbes. None of the IPF subjects had clinical features of active infection, nor was there any evidence of same in detailed microscopic examinations and cultures of the explants. The inclusion of COPD controls with overt infections also shows that the presence of microbes is not invariably stimulatory in this model. We also believe it unlikely that these findings are unduly confounded by medications taken by some of the IPF patients. Ethical and other clinical considerations preclude abrupt medication discontinuations in these ill-fated subjects, solely for study purposes, despite the dubious efficacy of the treatments (11). Immunosuppressants have been previously reported to decrease production of proinflammatory cytokines (33), autoantibodies (34), and oligoclonal T cell proliferations (35). Moreover, previous findings of normal TCRBV repertoires among heavily immunosuppressed allograft recipients with no evidence of rejection show these medications do not, conversely, induce de novo TCR biases or CD4 T cell oligoclonal expansions per se (7). Whatever trends might be present suggested medications actually could decrease some of the abnormal T cell findings here. The present data reflect ongoing immunologic processes in a large cohort of real-life IPF patients, both on and off medical treatments, and even if these medications had significant, albeit undetectable, effects on the assays here, this confounding would almost certainly act to minimize the immunologic abnormalities we observed in these subjects. The role of immune mechanisms in the pathogenesis of IPF has been questioned largely on the basis of extrapolations made from clinical observations (2). One of these arguments centers on subjective interpretations of pulmonary biopsies that typically show the inflammatory infiltrates within lungs of far-advanced IPF are not prominent. However, multiple investigations also demonstrate mononuclear collections (including activated effector T cells) are unmistakably present in IPF lungs (1, 26, 27, 36, 37, 38, 39). Moreover, similar or even lesser degrees of T cell infiltration are frequently noted in other adaptive immune diseases, including lung allograft rejection (40) and various autoimmune syndromes (1, 36, 37, 41, 42, 43, 44), particularly in late fibrotic stages. The refractoriness of IPF to conventional immune modulation therapy has also been cited as evidence that precludes an inflammatory pathogenesis (2). However, resistance to treatment is common in many other fibroproliferative diseases in which T cells are known to play central roles, particularly in late cases with advanced lung fibrosis and a paucity of active, ongoing alveolitis (analogous to IPF), and mortality among these patients remains considerable despite drug treatments (3, 4, 7, 41, 42, 43, 44). Among many possibilities, autoreactive T cell clones may be relatively resistant to conventional immune modulation, particularly after undergoing phenotypic changes induced by repetitive proliferations (45). Thus, conventional treatments could potentially enrich for disease-causing lymphocytes, and increase their homeostatic proliferations (to fill the “T cell void”). Alternatively, treatments could selectively deplete more susceptible disease-inhibiting regulatory T cells or immune effectors that predominantly elaborate anti-fibrotic mediators, including IFN-γ or IL-10. The injurious responses downstream of the initial adaptive immune activation could also be self-sustaining, even after later depletions of the inciting lymphocytes, or become irreversible, despite the presence of anti-fibrotic mediators, especially if these processes were far advanced (46). Finally, currently used treatments are nonselective immunosuppressants that do not specifically target and may not have much comparative efficacy on activated effector T cell clones, and in any event, these agents have myriad toxic effects that ultimately limit their dosing (47). The present data show that IPF patients frequently have autoantibodies and self-reactive CD4 T cells, thus fulfilling diagnostic criterion of an autoimmune disease (5). Identification of the IPF Ag that initiates or drives this process awaits additional study, but possibilities include exogenous environmental proteins or haptens, products of a chronic microbial infection (e.g., microbial mimicry) (3), or neoaccessibility of a normally sequestered self-determinant for which tolerance has been lost or was never acquired (48). Future developments could possibly obviate or ameliorate these processes by specific targeting of pathogenic T cell clones or subpopulations, production of Ag-specific regulatory T cells or, if this disease is a generalized response triggered by a still-undiscovered chronic microbial Ag (3, 5), direct eradication (or prevention) of the inciting infection. We gratefully appreciate the gift of the TCRBV ribroprobe set by Dr. Argyrios Theofilopoulos, the assistance of Dr. Kenneth McCurry and the University of Pittsburgh lung transplantation program, and the work by Kathleen Lindell, R.N., Lorrie Lucht, B.S., and Gisele Lombard, R.N. that made these studies feasible. ↵1 This research was supported in part by U.S. National Institutes of Health Grants 1R01HL64192, 1R01HL073241, 1P50HL084932, 1R01AR050840, and a donation from the Dorothy P. and Richard P. Simmons family. ↵2 C.A.F.-B. and C.G.T. contributed equally to this work. ↵4 Abbreviations used in this paper: IPF, idiopathic pulmonary fibrosis; FVC, forced vital capacity; COPD, chronic obstructive pulmonary disease; TCRBV, T cell Ag receptor β-chain variable region. American Thoracic Society. 2000. Idiopathic pulmonary fibrosis: diagnosis and treatment: international consensus statement, American Thoracic Society (ATS), and the European Respiratory Society (ERS). Am. J. Respir. Crit. Care Med. 161: 646-664. Selman, M., V. J. Thannickal, A. Pardo, D. A. Zisman, F. J. Martinez, L. P. Lynch, III. 2004. Idiopathic pulmonary fibrosis: pathogenesis and therapeutic approaches. Drugs 64: 406-430. Wynn, T. A.. 2004. Fibrotic disease and the TH1/TH2 paradigm. Nat. Immunol. Rev. 4: 583-594. Ermann, J., C. G. Fathman. 2001. Autoimmune diseases: genes, bugs, and failed regulation. Nat. Immunol. 2: 759-761. Feghali-Bostwick, C. A., T. A. Medsger, Jr, T. M. Wright. 2003. Analysis of systemic sclerosis in twins reveals low concordances for disease and high concordance for the presence of antinuclear antibodies. Arthritis Rheum. 48: 1956-1963. Duncan, S. R., C. Leonard, J. Theodore, M. Lega, R. E. Girgis, G. D. Rosen, A. N. Theofilopoulos. 2002. Oligoclonal CD4 T cell expansions in lung transplantation recipients with obliterative bronchiolitis. Am. J. Respir. Crit. Care Med. 165: 1439-1444. Sempowski, G. D., P. R. Chess, R. P. Phipps. 1997. CD40 is a functional activation antigen and B7-independent T cell costimulatory molecule on normal human lung fibroblasts. J. Immunol. 158: 4670-4677. Atamas, S. P., I. G. Luzina, H. Dai, S. G. Wilt, B. White. 2002. Synergy between CD40 ligation and IL-4 on fibroblast proliferation involves IL-4 receptor signaling. J. Immunol. 168: 1139-1145. Ask, K., G. E. M. Martin, M. Kolb, J. Gauldie. 2006. Targeting genes for treatment in idiopathic pulmonary fibrosis. Proc. Am. Thorac. Soc. 3: 389-393. Streiter, R. M., K. M. Starko, R. I. Enelow, I. Noth, V. G. Valentine. 2004. Effects of interferon-γ1b on biomarker expression in patients with idiopathic pulmonary fibrosis. Am. J. Resp. Crit. Care Med. 170: 133-140. Distler, J. H., A. Jungel, D. Caretto, U. Schultze-Horsel, O. Kowal-Bielecka, R. E. Gay, B. A. Mechel, U. Muller-Ladner, J. R. Kalden, S. Gay, O. Distler. 2006. Monocyte chemoattractant protein 1 released from glycosaminoglycans mediates its profibrotic effects in systemic sclerosis via the release of interleukin-4 from T cells. Arthritis Rheum. 54: 214-215. Yamamura, Y., R. Gupta, Y. Morita, X. He, R. Pai, J. Endres, A. Freiberg, K. Chung, D. A. Fox. 2001. Effector function of resting T cells: activation of synovial fibroblasts. J. Immunol. 166: 2270-2275. Miranda-Carus, M.-E., A. Balsa, M. Benito-Miguel, C. P. de Ayala, E. Martin-Mola. 2004. IL-15 and the initiation of cell contact-dependent synovial fibroblast-T lymphocyte cross-talk in rheumatoid arthritis: effect of methotrexate. J. Immunol. 173: 1463-1476. Alaibac, M., E. Berti, C. Chizzolini, S. Fineshchi, A. V. Marzano, B. Pigozzi, E. Riboldi, S. Sozzani, A. Kuhn. 2006. Role of cellular immunity in the pathogenesis of autoimmune skin diseases. Clin. Exp. Rheumatol. 24: S14-S19. Maini, M. K., G. Casorati, P. Dellabona, A. Waxk, P. C. L. Beverely. 1999. T-cell clonality in immune responses. Immunol. Today 20: 161-166. Shimizudani, A., H. Murata, H. Keino, S. Kojo, H. Nakamura, Y. Morishima, T. Sakamoto, M. Ohtsuka, K. Sekisawa, M. Sumida, et al 2002. Conserved CDR 3 region of T cell receptor BV gene in lymphocytes from bronchoalveolar lavage fluid of patients with idiopathic pulmonary fibrosis. Clin. Exp. Immunol. 129: 140-149. Cathcart, M. K., L. I. Emdur, K. Ahtiala-Stewart, M. Ahmad. 1987. Excessive helper T-cell function in patients with idiopathic pulmonary fibrosis: correlation with disease activity. Clin. Immunol. Immunopathol. 43: 382-394. Selman, M., G. Gonzalez, M. Bravo, J. Sullivan-Lopez, C. Ramos, M. Montano, N. Barquin, F. Vadillo. 1990. Effect of lung T lymphocytes on fibroblasts in idiopathic pulmonary fibrosis and extrinsic allergic alveolitis. Thorax 45: 451-455. Postlethwaite, A. E., J. Keski-Oja, H. L. Moses, A. H. Kang. 1987. Stimulation of the chemotactic migration of human fibroblasts by transforming growth factor β. J. Exp. Med. 165: 251-257. Bruijn, J. A., A. Roos, B. de Geus, E. de Heer. 1994. Transforming growth factor-β and the glomerular extracellular matrix in renal pathology. J. Lab. Clin. Med. 123: 34-47. Moore, K. W., V. de Waal, R. Malefyt, R. L. Coffmen, A. O’Garra. 2001. Interleukin-10 and the interleukin-10 receptor. Annu. Rev. Immunol. 19: 683-765. Sime, P. J., R. A. Marr, D. Gauldie, Z. Xing, B. R. Hewlett, F. L. Graham, J. Gauldie. 1998. Transfer of tumor necrosis factor-α to rat lung induces severe pulmonary inflammation and patchy interstitial fibrogenesis with induction of transforming growth factor-β 1 and myofibroblasts. Am. J. Pathol. 153: 825-832. Kelly, M., M. Kolb, P. Bonniaud, J. Gauldie. 2003. Re-evaluation of fibrogenic cytokines in lung fibrosis. Curr. Pharm. Des. 9: 39-49. Homolka, J., M. W. Ziegenhagen, K. I. Gaede, P. Entzian, G. Zissel, J. Muller-Quernheim. 2003. Systemic immune cell activation in a subgroup of patients with idiopathic pulmonary fibrosis. Respiration 70: 262-269. Wallace, W. A. H., S. E. M. Howie, A. S. Krajewski, D. Lamb. 1996. The immunologic architecture of B-lymphocyte aggregates in cryptogenic fibrosing alveolitis. J. Pathol. 178: 323-329. Marchal-Somme, J., Y. Uzunhan, S. Marchand-Adam, D. Valeyre, V. Soumelis, B. Crestani, P. Soler. 2006. Cutting edge: nonproliferating mature immune cells form a novel type of organized lymphoid structure in idiopathic pulmonary fibrosis. J. Immunol. 176: 5735-5739. Magro, C. M., W. J. Waldman, D. A. Knight, J. N. Allen, T. Nadasdy, G. E. Frambach, P. Ross, C. B. Marsh. 2006. Idiopathic pulmonary fibrosis related to endothelial injury and antiendothelial cell antibodies. Hum. Immunol. 67: 284-297. Dobashi, N., J. Fujita, M. Murota, Y. Ohtsuki, I. Yamadori, T. Yoshinouchi, R. Ueda, S. Bandoh, T. Kamei, M. Nishioka, et al 2000. Elevation of anti-cytokeratin 18 antibody and circulating cytokeratin 18: anti-cytokeratin 18 antibody immune complexes in sera of patients with idiopathic pulmonary fibrosis. Lung 178: 171-179. Chapman, J. R., P. J. Charles, P. J. Venables, P. J. Thompson, P. L. Haslam, R. N. Maini, M. E. Turner-Warwick. 1984. Definition and clinical relevance of antibodies to nuclear ribonucleoprotein and other nuclear antigens in patients with cryptogenic fibrosing alveolitis. Am. Rev. Respir. Dis. 130: 439-443. Yang, Y., J. Fujita, S. Bandho, Y. Ohtsuki, I. Yamadori, T. Yoshinouchi, T. Ishida. 2002. Detection of antivimentin antibody in sera of patients with idiopathic pulmonary fibrosis and non-specific interstitial pneumonia. Clin. Exp. Immunol. 128: 169-174. Wallace, W. A., S. E. Howie. 2001. Upregulation of tenascin and TGF-β production in a type II alveolar epithelial cell line by antibody against a pulmonary auto-antigen. J. Pathol. 195: 251-256. McBride, W. T., S. Allen, S. M. C. Gormley, I. S. Young, E. McClean, S. W. MacGowan, P. Elliott, T. J. McMurray, M. A. Armstrong. 2004. Methylprednisolone favorably alters plasma and urinary cytokine homeostasis and subclinical renal injury at cardiac surgery. Cytokine 27: 81-89. Czaja, A. J.. 1999. Drug therapy in the management of Type 1 autoimmune hepatitis. Drugs 57: 49-68. Okamoto, R., K. Yamamoto, K. Yabushita, N. Okano, N. Shimada, S. Matsumura, M. Mizuno, T. Higashi, T. Tsuju. 2001. T cell repertoire in primary biliary cirrhosis: a common T cell clones and repertoire change after treatment. J. Clin. Immunol. 21: 278-285. Katzenstein, A.-L. A., J. L. Myers. 1998. Idiopathic pulmonary fibrosis: clinical relevance of pathologic classification. Am. J. Respir. Crit. Care Med. 157: 1301-1315. Nagao, T., S. Nagai, M. Kitacichi, M. Hayashi, M. Shigematsu, T. Tsutsumi, N. Satake, T. Izumi. 2001. Usual interstitial pneumonia: idiopathic pulmonary fibrosis versus collagen vascular diseases. Respiration 68: 151-159. Flaherty, K. R., W. D. Travis, T. V. Colby, G. B. Toews, E. A. Kazerooni, B. H. Gross, A. Jain, R. L. Strawderman, A. Flint, J. P. Lynch, F. J. Martinez. 2001. Histopathologic variability in usual and nonspecific interstitial pneumonias. Am. J. Respir. Crit. Care Med. 164: 1722-1727. Kradin, R. L., M. B. Divertie, R. B. Colvin, J. Ramierez, J. Ryu, H. A. Carpenter, A. K. Bhan. 1986. Usual interstitial pneumonitis is a T-cell alveolitis. Clin. Immunol. Immunopathol. 40: 224-235. Yousem, S. A., G. J. Berry, P. T. Cagle, D. Chamberlain, A. N. Husain, R. H. Hruban, A. Marchevsky, N. P. Ohori, J. Ritter, S. Stewart, H. D. Tazalaar. 1996. Revision of the 1990 working formulation for the classification of pulmonary allograft rejection: lung rejection study group. J. Heart Lung Transplant. 15: 1-15. Lamblin, C., C. Bergoin, T. Saelens, B. Wallaert. 2001. Interstitial lung diseases in collagen vascular diseases. Eur. Respir. J. 32: 69s-80s. Kim, E. A., K. S. Lee, T. Johkoh, T. S. Kim, G. Y. Suh, O. J. Kwon, J. Han. 2002. Interstitial lung disease associated with collagen vascular diseases: radiologic and histopathologic findings. Radiographics 23: S151-S165. White, B., W. C. Moore, F. M. Wigley, H. G. Xiao, R. A. Wise. 2000. Cyclophosphamide is associated with pulmonary function and survival benefit in patients with scleroderma and alveolitis. Ann. Intern. Med. 132: 947-954. Hubbard, R., A. Venn. 2002. The impact of coexisting connective tissue disease on survival of patients with fibrosing alveolitis. Rheumatology 41: 676-679. Jendro, M. C., T. Ganten, E. L. Matteson, C. M. Weyand, J. J. Goronzy. 1995. Emergence of oligoclonal T cell populations following therapeutic T cell depletion in rheumatoid arthritis. Arthritis Rheum. 38: 1242-1251. King, M. B., A. C. Pedtke, H. L. Levrey-Hadden, M. I. Hertz. 2002. Obliterative airway disease progresses in heterotopic allografts without persistent alloimmune stimulus. Transplantation 74: 557-562. Baughman, R. P., F. O. Alabi. 2001. Nonsteroidal therapy for idiopathic pulmonary fibrosis. Curr. Opin. Pulm. Med. 7: 309-313. Lee, S.-H., S. Goswami, A. Grudo, L.-Z. Song, V. Bandi, S. Goodnight-White, L. Green, J. Hacken-Bitar, J. Huh, F. Bakaeen, et al 2007. Antielastin autoimmunity in tobacco smoking-induced emphysema. Nat. Med. 13: 567-569.